Kevin C. Cox/Getty ImagesBrandt Snedeker had the round of a lifetime on Thursday, shooting 59 in the opening round at Wyndham. Brandt Snedeker played the round of his life on Thursday, becoming the ninth golfer in PGA Tour history to post a score of 59. Snedeker’s masterpiece was made thanks to an astounding hole-out eagle on one of the final holes of his round that left even him in disbelief. After missing one putt that would have gotten him to the number, Snedeker sunk a 20-foot birdie on his final hole of the round to enter the history books. 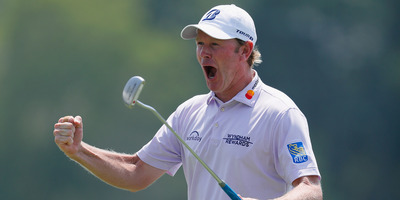 Brandt Snedeker played the round of his life at the Wyndham Championship on Thursday, posting an 11-under to become just the ninth golfer in PGA Tour history to post a score of 59. Snedeker had opened the round with a bogey, but righted the ship quickly and went an unconscious 8-under over his final nine holes to reach the historic mark. For Snedeker, who started his round on the 10th hole, the most critical shot of his round came at the par-4 sixth, where he holed out from a whopping 176 yards (160 metres) out. There was no bounce and no backspin – he just took his seven iron and dunked his ball right into the hole. That shot brought Snedeker to 9-under on the round with three holes left to play, needing two more birdies to join the 59 club. He birdied the seventh, and barely missed his birdie putt on the eighth, meaning it would all come down to the final hole. On the ninth green, Snedeker stared down the 20-foot birdie that stood between him and history, and sent it home. Snedeker’s 11-under put him five strokes ahead of the field after one round, but more importantly, puts him amongst some of the greatest rounds in golf history. Meeting with the media after the round, Snedeker was clearly still struck by the moment. Snedeker tees off again at 12:40 p.m. on Friday when he will attempt to add to his already impressive lead.